Ginormous Ridonkulous New Hot Deals & Toys For Tots! Hey guys this is Jimbercane posting. Toys For Tots is here with Ginormous Ridonkulous! He is hosting Toys For Tots in the Cazmo Rena! The show will start at 7 o’clock, and to donate to this organization, just buy some Cazmo Cash. You can do this by clicking on the Dollar Icon on your Chatbar. After that, just select the amount of Cazmo Cash you want. After doing so, you will be sent to a page where you will have to pay for the amount you selected. Speaking about Ginormous Ridonkulous, the VIP Backstage Pass is open to all Cazmos for this weekend! If you go in there, and speak to Ginormous, you get a free Backstage Pass from him! To get this pass, first click on the Map Icon on your Chatbar. After doing so, click on the location on your Map called Cazmo Rena. It doesen’t matter which Cazmo Rena you choose, just select anyone. After you are there, go to the VIP Backstage Area which is somewhere in the top left hand corner of the room. After you are there, go and speak to Ginormous, and select the second option. After doing this, you will have the pass added to your CazBook! You will notice that he mentions, that he will be debuting his famous Planet Cazmo TV Show sometime in January! I can’t wait! .To view your pass, first click on your Cazmo. Doing this, will open his/her Playercard. 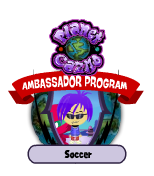 Click on the My CazBook Button, which is on the near top of his/her Playercard. After doing so, click on the My Awards section on the left of the book. After you do this, you will see all of the passes that you have, as well as your newest one; The Toys For Tots Backstage Pass! Finally, there are some new Hot Deals. The Hot Deals, are basically new furniture and instruments that have been added today! I found out about this, by looking at the Hot Deals Section in the Newspaper. Normally, you are able to buy the items shown in this section by hovering over them with your mouse, and then clicking them. Unfortunately, you can’t do that for the bottom part of this section, so you will just have to buy it orally.